Dr Scott Miller the charismatic Australian veterinary surgeon from Channel 4's ‘Vet on the Hill’ and ITV's 'This Morning' has chosen to spend his ninth wedding anniversary weekend on his first ever house sit, looking after a small farm with more than 70 animals included. 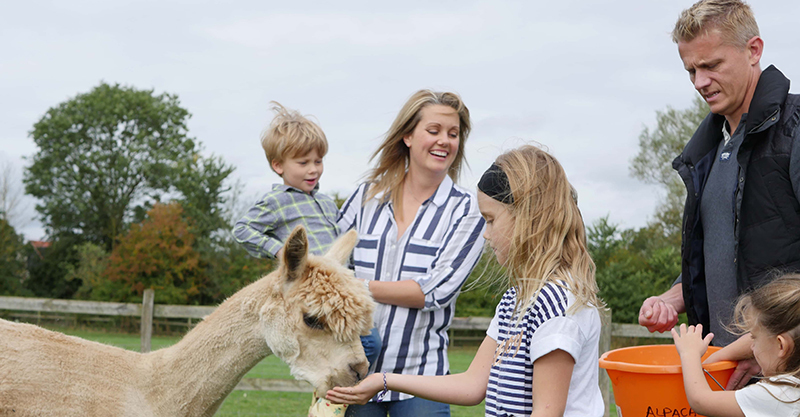 The pretty farm in the Worcestershire countryside became Dr Scott’s home for the weekend and together with his TV presenter wife Zoe and three young children, Summer, Quinn and Jackson. Together, they looked after the resident dogs and 70 farm animals including goats, alpacas, sheep, pigs, rabbits, budgies, dogs, ducks, geese and hens while the farm's owners were away. When asked about any challenges, Scott mentions a mischevious escapee goat which decided it wanted to mingle with alpacas for the day, much to the disgust of the alpacas. Scott said “running around trying to chase the goat was a high point for the kids and the onlooking ducks and pigs, but as you can imagine it was a low point for me - goats are very fast!." Other than that, despite looking after such a large menagerie of animals and three young children at the same time, the sit was free from drama. Scott and Zoe found experiencing the charm of farm life, away from busy London, a complete joy. Scott explained: “Animals do respond to a new carer better than a new environment. Most animals are particularly bonded to their home and the smells that are present there and also the smells of their owners, even when they’re not there. So for me, it’s best if they can stay put, stay in their own surroundings, and be looked after by a carer. And that’s what TrustedHousesitters provides." Susanna Emsley, the owner of the Worcestershire smallholding that Scott took care of with this family is full of praise about her house sitting experience with the Millers. Susanna said:“As you can imagine, owning 70 animals, from dogs and ducks to pigs and alpacas, it’s not easy to get away for a weekend break! But when the person who puts themselves forward for your house sit is our family hero, Dr Scott Miller, the TV vet we watch on ’The Vet on The Hill' then you can only imagine the peace of mind we had leaving our pets and house for a few nights. We never dreamed we would meet Dr Scott in real life let alone have him move in to take care of the farm! Although her other sitters haven't all been celebrity vets, Susanna explained they have all been fantastic: "This is our third house sitter this year, all were found through TrustedHousesitters, and we’ve been delighted. It has made a big difference to our lives. Although it is great to have animals it is also important to have a break. We can now plan holidays and trips abroad as regularly as other people, in fact we have just done our first long haul trip in years to Tanzania, leaving our animals for three weeks in safe, confident hands with sitters staying in our home for free."